The Audi TT comes powered by a choice of 4-cylinder engines with available all-wheel-drive. Roadsters seat two, while the coupe seats four in a handsome and well handling package. For 2010, Audi has simplified the TT lineup. 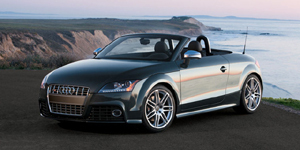 All 2010 Audi TT models come with a turbocharged four-cylinder engine and Audi's S-tronic DSG transmission. The former 3.2-liter V6 and 2.0T front-wheel-drive models are not available any longer. Find the used Audi TT of your choice from a dealer in your area. Search our used car listings now.